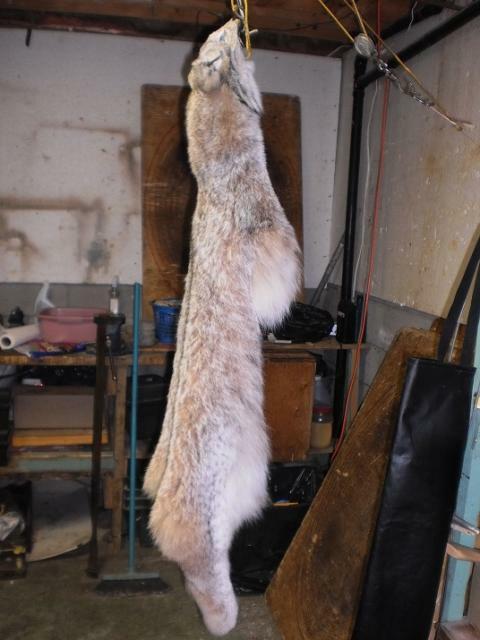 I'm new to the forum, trapping, and tanning. 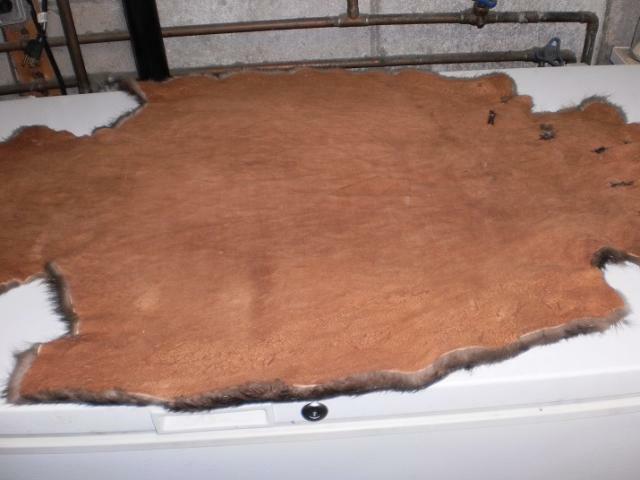 I'm attempting to make some leather out of a hog hide that I butchered a couple weeks ago. I have it soaking in the solution right now(alum). my question is when to tell when it is done. I seen a few video's and theirs all turned brownish. my hide is white, of course, and the solution is clear/white. is there something I should be looking for? Its been there for a week tomorrow night. I believe it should be done in a week, but if I don't know for sure I'm going to leave till this weekend, especially since it is a thicker hide. any info is appreciated. Leaving it in longer wont hurt it as long as your solution is mixed properly for the weight of skin you are tanning. That said a week should be plenty.You can take it out and scud it over the beam and then put it back in the solution for a couple more days. This is a lynx I did a while back using the alum method.Very easy and great results. Last edited by Boco; 09/22/14 01:59 PM. Good for a wall hanger.It has to be re-tanned (ie chrome or veg) to withstand garment use.An alum tan will leach out of the leather if it gets wet from sweat etc. An alum tanned hide is easy to re-tan with better results than a straight garment tan. Thanks Boco..that is what I've been told. 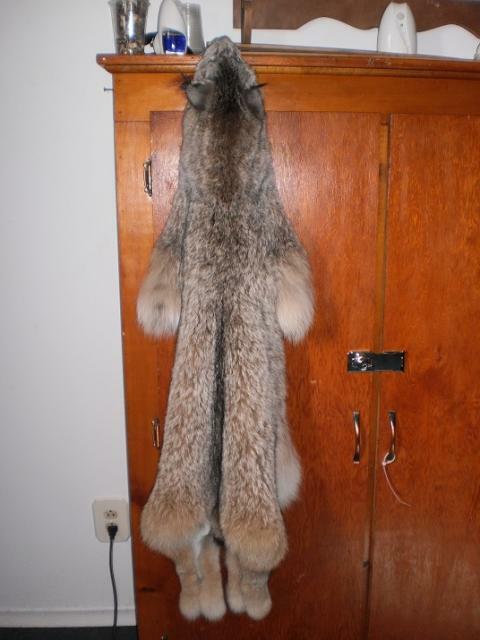 Here is the same lynx after a re-immersion garment tan. Last edited by Boco; 09/22/14 03:37 PM. How do you do your garment tanning Boco? I have alum tanned a few skins and get great results but really want to make a wearable product. I use the paste method of alum tanning but your results have me thinking of giving the soak method a try this year. I also got a box of Dixie Tan to see how it works. Do you think smoking an alum tanned hide would make it permanently tanned and wearable? I have used both Chrome tan and ez100 synthetic tan. Both gave great results of use on heavy used garnets like mukluks and hats that can take a beating from repeated wetting. Which was easier to work with and which had less warning about toxicity as I like to keep my use of harsh chemicals down? If the harder process is less toxic I would probably opt for more work and less chemicals. Tanning chemicals can be slightly caustic but they are not toxic unless you drink them or something like that. After an alum tan you can re-tan with any commercial tanning product with great results.A good one is Lutan F.I have been told.I have never used that particular product yet. 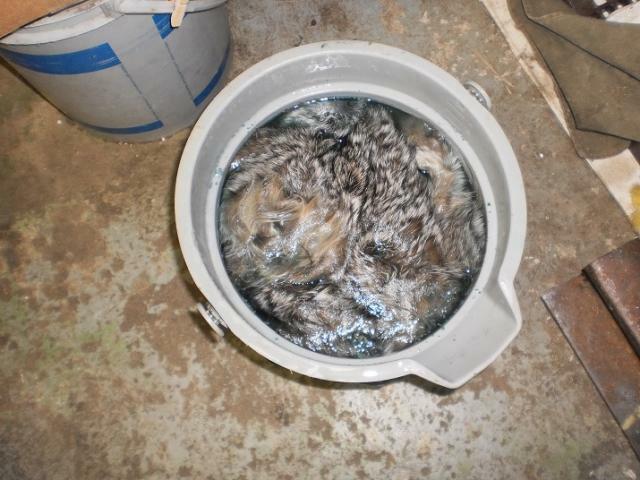 You can veg tan a furskin that has been alum tanned first and get lasting garment quality product.Quebracho is the veg tanning agent most easily obtained(the brown logwood trap dye is quebracho).The only problem is it stains the fur of light colored animals.Bark,leaves and galls of certain plants,etc have tannins in them and they can be extracted for tanning purposes,it depends on how much work you are prepared to do.Large tanneries in the mid 1800's were located in central Ontario because the bark of the hemlock tree(high in tannin) was readily available. I would say they are all easy to work with,but tanning skills require practice.Pretty hard to go wrong when you do an alum tan first. A beaver and an otter veg tanned with quebracho after being alum tanned first.This tan is great for mitts as the leather is extremely durable. Last edited by Boco; 09/22/14 05:15 PM. Boco what kind of thinning knife or process do you use? Hiverman ez100 and the safety acid is a good way to go. 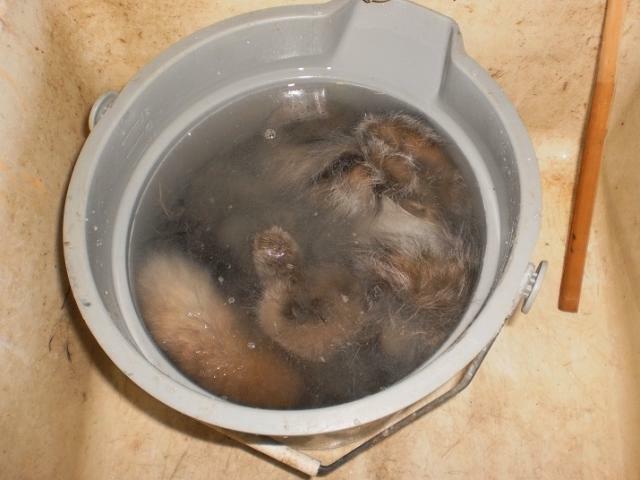 The chrome tan is said to be more risky as far as what you put back out in the system. And I suppose the ingestion of any stray dust would not be so good. FT,the chrome used in tanning is not toxic-it is tri-valent chrome salt.It is used as food additive as the body uses this type of chrome. The dangerous chrome is hexavalent chrome.A while back some leathers imported from India and China had traces of hexavalent chrome in them giving chrome leather a bad rap. 90% of all leathers used today are chrome tanned.I got this information from the leather institute in England which tests leather and is at the top in leather chemistry and new tanning technology. 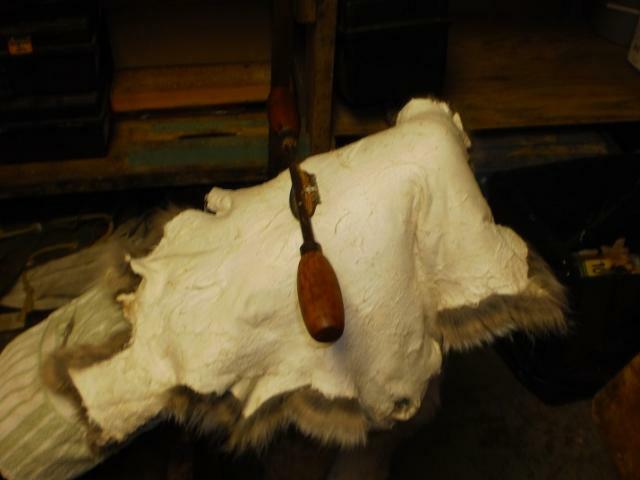 I use a spokeshave on the beam to thin thick hides. beautiful furs. Mine is a hog with hair off. I have a pound of salt and a 1/2 pound of alum in 2 1/2 gallons of water if I recall correctly. If you think I should add more of something please let me know. I'm planning on making a work apron(so I don't get so messy next time) or a pair of chaps for cutting wood, or something. since this is my first attempt I'm not planning on mine looking near as professional as yours BUT HOPEFULLY SOMEDAY!!! last question. If I smoke the alum tanned hides would that make them more water resistant and better for clothing. this was my plan. You have been a great help, wish I would have gotten on here sooner. For an apron or chaps I would recommend a re tan with veg. Since it is hair off you should be ok with the mix you did. 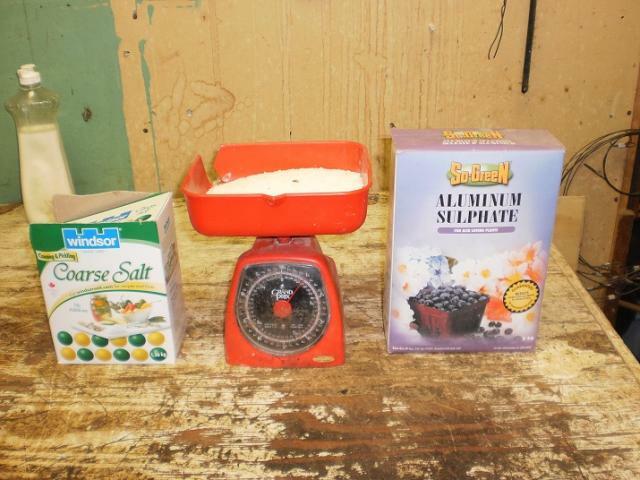 Aluminum sulfate(another type of alum)and pickle salt is mixed 1 lb to 1 lb to 2 gal of water. Last edited by Boco; 09/22/14 09:47 PM. Thanks for the info Boco! 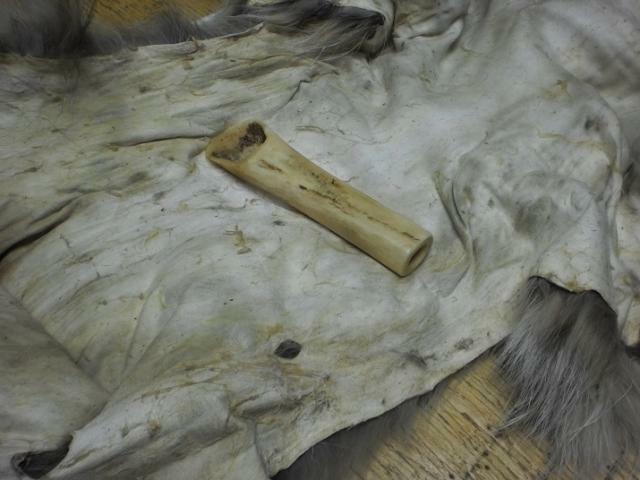 What did you think about my question as to whether smoking an alum tanned hide would be any good, maybe if not for garment purposes but just as an extra step to really preserve a wall hanger? 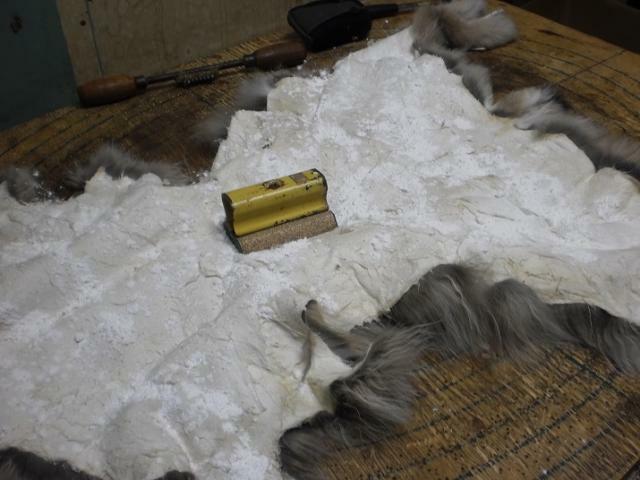 I have only smoked soap(brain)tanned hides.It wouldn't hurt it to try.I have also re-tanned soap tanned fur with quebracho, and it turned out very good with fast penetration of the tannins that is necessary to preserve the fur and not have hairslip. If you try smoking your alum tanned pig skin,make sure it does not get any heat or it will ruin it. Smoke both sides,and let us know how it turns out. After you are done smoking the hide,and it is soft and dry,you can check it by wetting a piece,then letting it dry.If it is easy to soften it might be good.If it is stiff and cracks means the smoking did not work. I find the thing that keeps tanning interesting is experimenting with different methods and combinations of methods. Last edited by Boco; 09/23/14 11:41 AM. 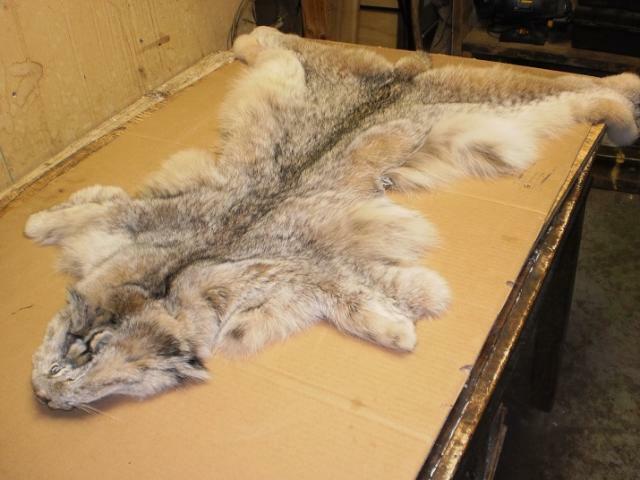 Boco do you tan your beaver from a fresh hide or do you salt and dry first? Beaver always was a crapshoot for me. From great to okay. Otter on the other hand always turned out great. Something about the ingrained fats I am sure. Put enzymes etc into combat that but never felt like I knew for sure during the process if it was going to turn out well or not. Both Chrome and EZ100. I have an actual Dakota thinning knife. 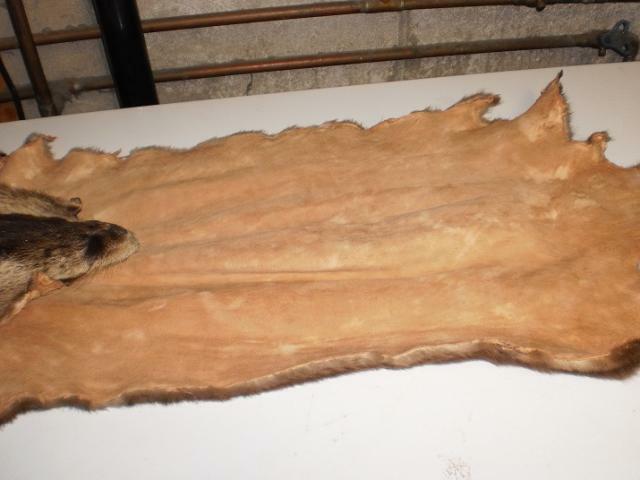 Seemed if I dried the hide first it never softened enough to use the machine as well so I tanned green. Well fleshed and degreased. I have made moose and caribou leather. Chrome tanned then used quebracho for color. Made some nice leather. Made a pistol holster out of a piece that fits well. I have tanned beaver fresh, salted, salt dried, and dried,and all turned out.With dried skins,you need to get them relaxed like when they were fresh skinned,and I always pre tan with aluminum sulfate before either chrome tanning or veg tanning.Beaver takes a lot of oiling.Also a lot of shaving with the spokeshave especially around the shoulders and cheeks. Never heard of alum tanning prior. Interesting.